It feels like a 3 tons truck is reverse parking on my chest. All I did was to bend down and open the bag which we had flung on the ground. The act of bending down, unzipping the bag, pulling out the thick coat and standing up again had winded me out! And my head was hurting something bad! I had two Panadols and a lot of water. I lay down for a while but nothing was working. Just then my 7-year-old walks in and says that she thinks she is having a heart attack in her head and chest. This is a sad way to go. We hadn’t even seen a single snow-capped peak yet! I need to mention here that I am a Keralite who grew up in Chennai. My daughter is a Dubai kid. Cities whose feet are firmly planted in the sea-shore. Our bodies are not used to anything higher than a small pleasant mountain like those in the Western Ghats and Switzerland. Luckily Reva walked in to our room at this point and being a veteran of these regions quickly recognized what ailed us – altitude sickness. And like a true Indian the solution was a nuska, a simple idea that works wonders – drink glasses of Eno every few hours. Who knew antacid helped treat altitude sickness!? Now here is the thing… if you are headed up to heights that you have not scaled before, and you are an average person in reasonably decent shape then start on a course of Diamox two days before you set out – half to one tablet every 8 hours for 3 days. You will not have to suffer a truck reverse parking on your chest or a heart attack in your head. After a long day’s drive and the effects of altitude sickness on the two of us, all the seven of us wanted to do was sit back, enjoy a hot meal and sleep. Anyways there was not much to see outside. The fog and the dark had set in. We were so tired and hungry that everything was tasty. I don’t remember what we ate but I do remember what Reva and I, were foolish enough to drink – apple wine – eeeyuck! An apple a day may keep the doc away but it sure has no place in the wine-press. A sip later Reva shifted to beer and I opted for whisky. Surya who had explored these parts about a year ago on a bike decided that we needed to turn in early as we needed an early start the next day. We were going to start by paying our respects to Hatu Devi, the Goddess (at the Hatu Mata Temple) in charge of our safety in these parts. 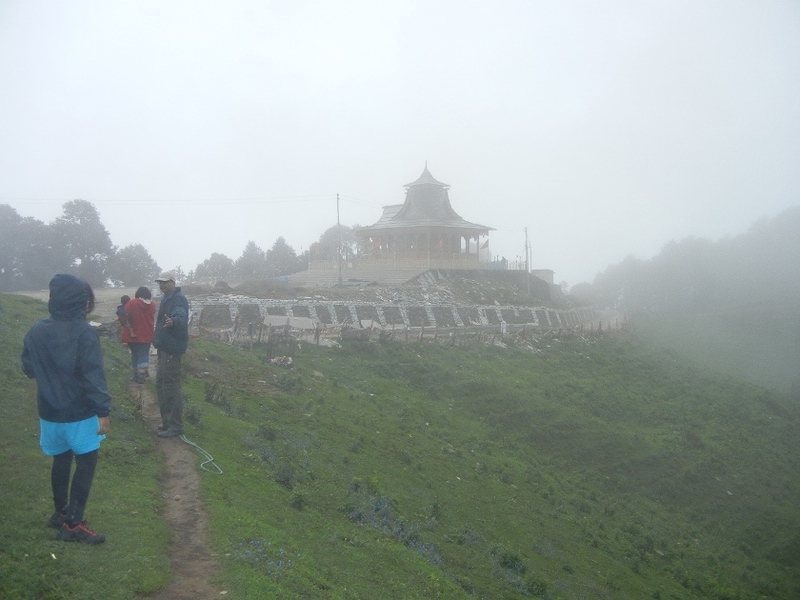 Typically for the Gods and Godesses in these regions her temple was placed not-so-conveniently at the top of Hatu Peak – just a nerve-racking drive up REALLY narrow mountain roads. 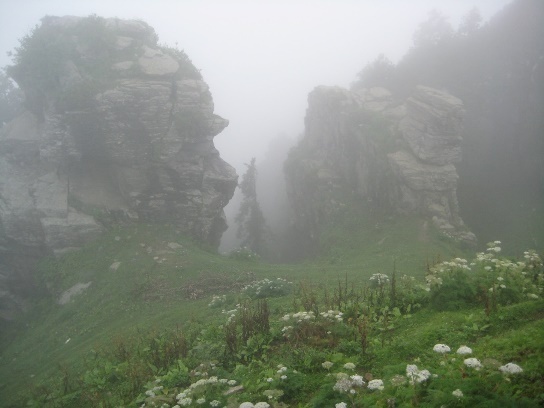 About 7 kilometers from Narkhanda, Hatu is home to many herbs with healing qualities and apparently the Pandavas have walked on these mountains during their 13 years of exile from their kingdom after losing a game of dice to the Kauravas. We even heard about the Bheem Chulla (stove used by the Pandava Bheem to cook up their meals) – two large stones arranged to resemble an old-fashioned stove. An exile is called an Agyaat Vyaas in Sanskrit – a name that even inspired a modern-day sanctuary that provides everything from yoga and meditation to exploration. Anyway we got on the road and I am feeling like a colossal fool, like one of those nut cases who jump off planes with parachutes. You know you are doing a dumb thing but you do it anyway. Once we got on that road there was no turning back until we reached the top. Now this is really not a road. It is a path – a mud path if you will, with a thin ribbon of tar in the middle. As usual there is the solid rock of the mountain on one side and unbelievably beautiful, heart stopping scenery plummeting away from us on the other side. One reason for starting out early was to get to the temple and back before other tourists or locals decided to get on this road. 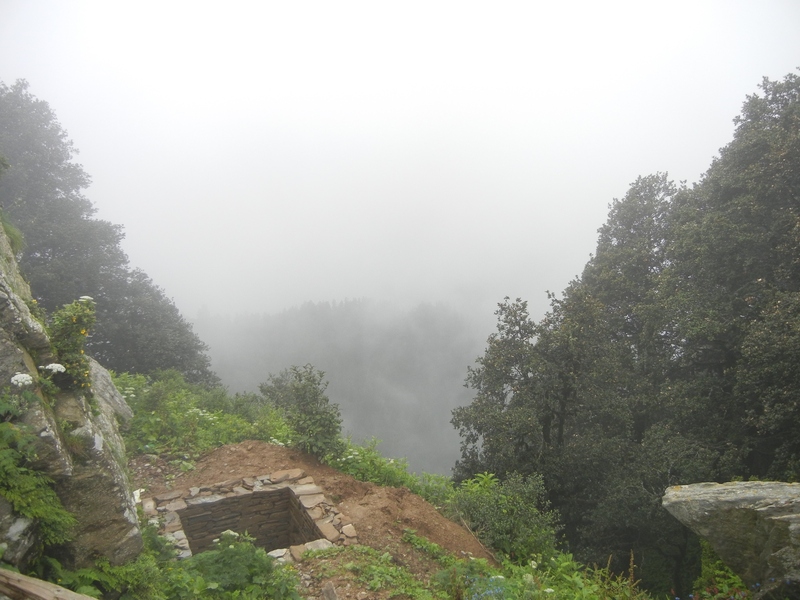 But somebody had beaten us to the top and was on the way back when we were driving up. On mountain roads people change the rules around a bit. When you face oncoming traffic, the drivers move their car to the ‘wrong’ side of the road so that the driver can see how far he is from the edge. It is a very sensible rule… but very scary for the passengers seated behind the driver. Anyway we did the criss-cross business and the tire’s crunched on the pebbles and stones on the edge and then we continued on wards. 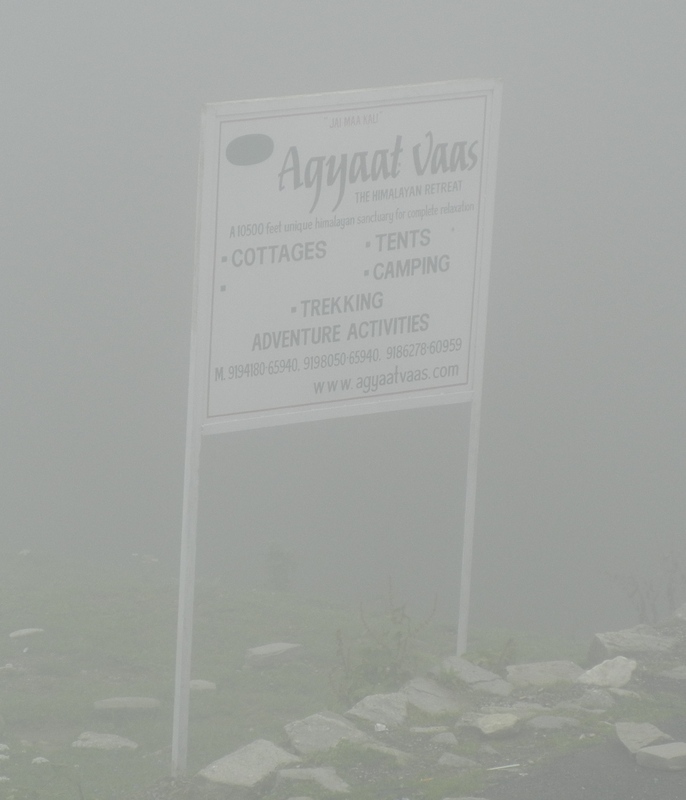 The fog was by now quite intense and we passed the Tani-Jubber Lake and the small hut (often used by Gujjars and sometimes by trekkers who are passing by) abutting it without really seeing them. And then just as suddenly we were at the top. If it weren’t for the sign board we would have had no clue! We parked the car along the side and trudged a few meters to the temple itself. It was COLD! But it was also so energizing. It could also have been euphoria at not having plummeted to the bottom. Either which way we felt on top of the world as we reached the temple. 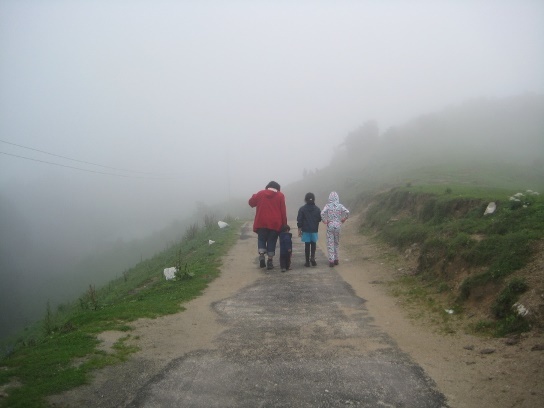 Walking to Hatu Devi Temple – the kids and the grown-ups had a blast! 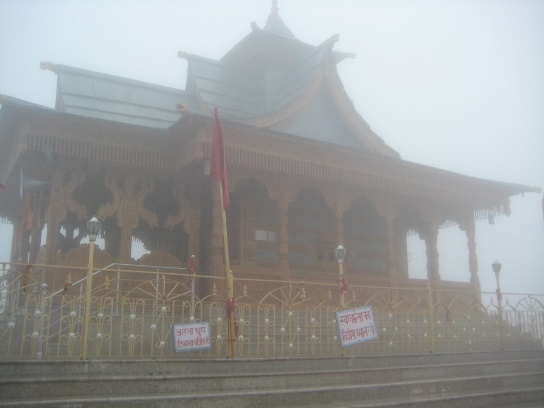 The temple appears out of the fog! There we saw a sign that said ‘Remove Footwear’. Since no one ever has the balls to break religious rules especially when you are in a land where religious fervor and passion are worn on your sleeves, we removed our shoes and socks and stepped on the wet, tiled floor. Luckily it was so cold that our feet went numb immediately so I did not feel any pain. 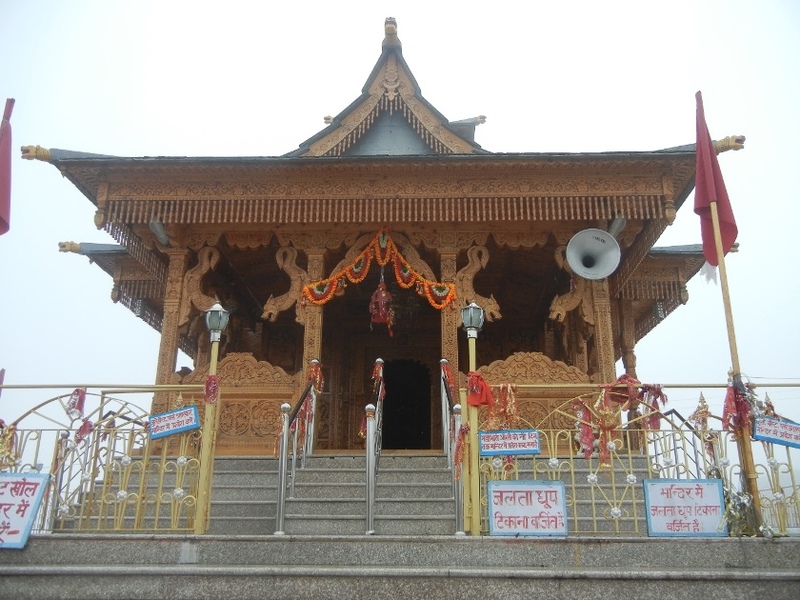 The temple itself is beautiful – a relatively new structure boasting of amazing woodwork depicting the Gods and Goddesses from Indian mythology. The detailed carving is a feast for the eyes. The priest was a surprisingly young guy in saffron clothes, wind cheater and a mobile. India always does that – surprising you by juxtaposing the old and the new in the most eccentric combinations possible. 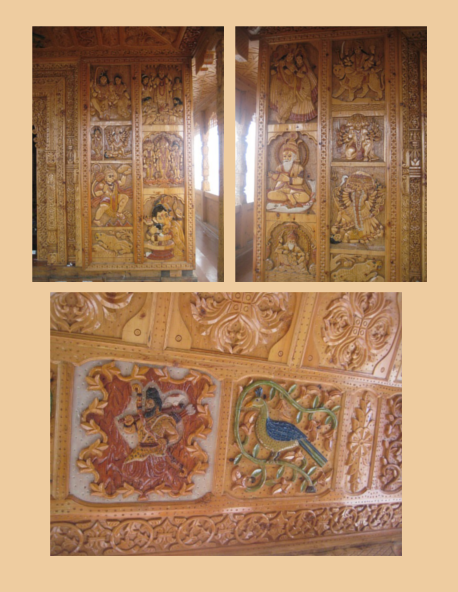 Amazingly detailed carving adorned the whole temple! A closer look at some of the work! 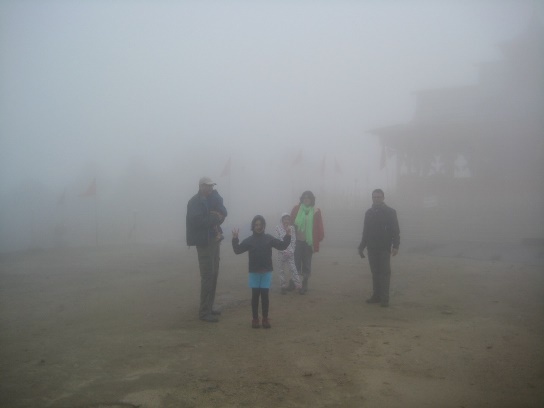 After offering our respects and walking around the temple and admiring its carvings we decided to walk around a bit as the fog was showing signs of lifting. But first we wanted to pee. But there was a slight problem – no public loos. So we did what any self-respecting traveler or trekker would do. We looked for a private spot and boy! did Reva find one! Seriously it involved taking a few steps along the edge and then looking out into the most amazing scenery as we did the job. Of course we took turns! 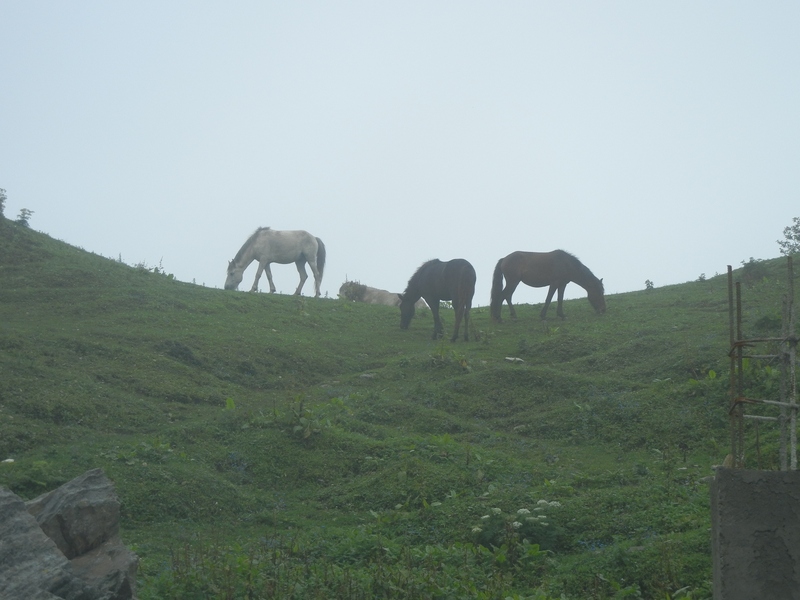 Some horses grazing on the mountain side further away were our only company! Mind blowing! What a spot – better than even Richard Branson’s Pacific island home’s luxe loo. The constantly changing fog cover just added to the magic. The rest of the peak also offered spectacular views! The rock faces were so monstrously strong. They looked invincible and like something out of Middle Earth. And then you had the soft, ethereal beauty of the flowers in the mountain. So delicate they looked like lace at times… more Austen than Tolkien. A beautiful contrast. 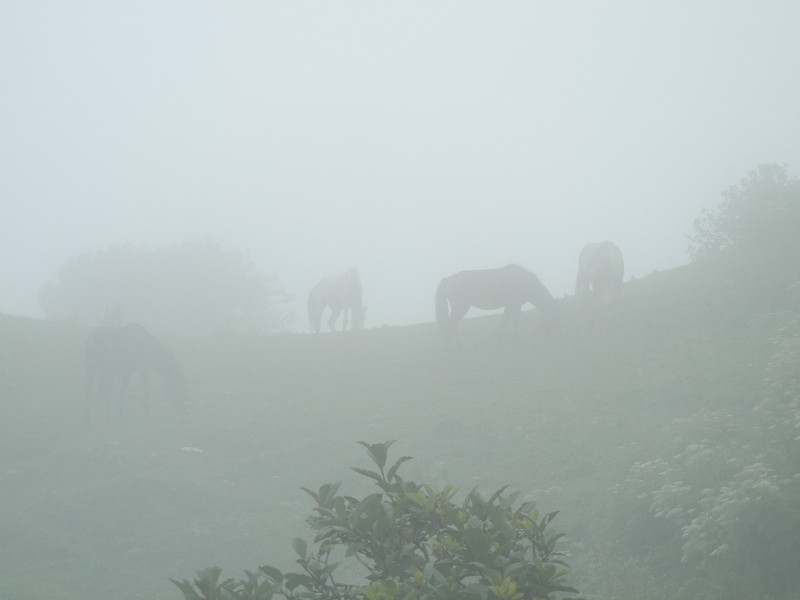 There is nothing more magical than seeing the fog lifting and unveiling the raw beauty of the Himalayas! We stayed up there for about 20 to 30 minutes and then decided that if we planned to reach our next destination on time we better head out soon. The next leg, according to Surya, was going to be a toughie! I was thinking – “Seriously tougher than the drive up to Hatu! You got be kidding me! Let’s go back to Chandigarh.” But my brain and tongue continued to suffer from, what my dad used to tag all electrical problems as – a loose connection. 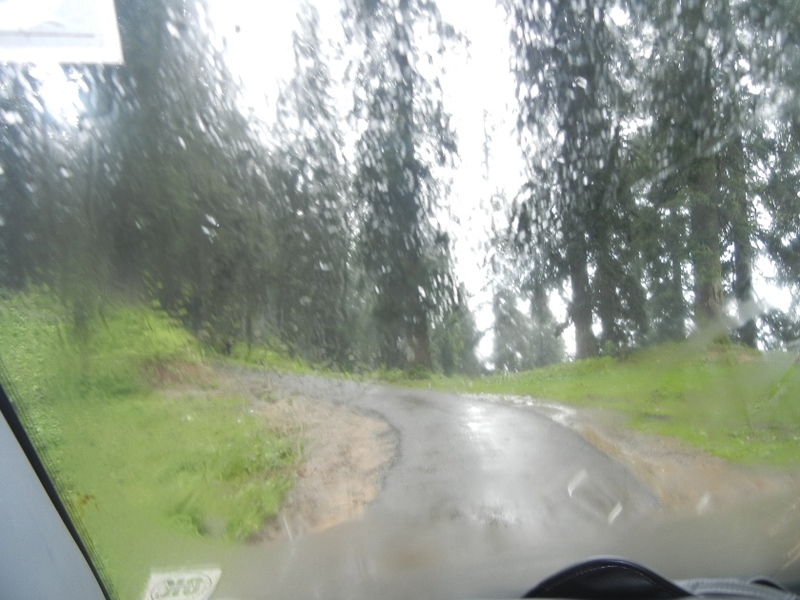 I joined the three other adults in telling the kids to get in to the car because we now had to head to Jalori Pass. But that’s another post altogether.